From 6:30 to 8:30 p.m. Sunday, Nov. 23, the students behind GW Animal Advocates will join forces with peta2 and PETA’s youth division to offer veganized Thanksgiving meals like stuffed Tofurkey (tofu turkey) and even free vegan recipe packs. 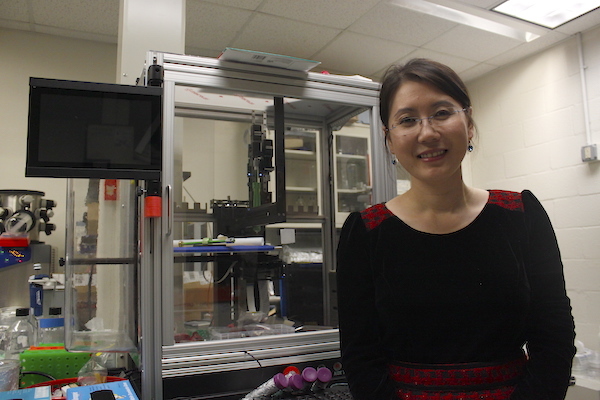 Bioengineer Lijie Grace Zhang is using three-dimensional printers to create tissue that replaces damaged parts of the human body, in a laboratory right on campus. Would you like a cat with your cappuccino? ‘Cat cafe’ coming to D.C.
A “cat cafe” called Crumbs & Whiskers is scheduled to open in D.C. this summer. King illuminated the audience with stories of his personal and professional life that fans could only dream of, from his meeting with a rabid dog that inspired his bestseller “Cujo” to his relationship with his wife and son. As the week-long festival wraps up this weekend, you’ll have the chance to chat with local artists, browse new galleries, attend workshops and even meet award-winning photographers like Bill Ingalls. Channel your creative side with this week’s crafty events, like a D.C. Puppet Slam, a theatre adaptation of a literary classic and a pasta-making workshop. Amsterdam Falafelshop, a popular Adams Morgan eatery, has just one thing to say to D.C. voters who marked “yes” next to Initiative 71 on Tuesday. This weekend, you can become an expert in Shakespeare’s “Julius Caesar,” a Flip Cup World Series champion and a National Gallery of Art-certified artist. Well, you better get started. Apartments.com listed Foggy Bottom/GWU/West End as the 12th-most expensive neighborhood in the country, behind Queens, N.Y. and San Diego, Calif.